Kemp’s ridley sea turtle, or the Atlantic ridley sea turtle, is the rarest species of sea turtle, and is critically endangered. It belongs to the genus Lepidochelys. A small genus containing only two species. Kemp’s ridley turtles are the most endangered of all sea turtles. There are freshwater turtles that are more critically endangered. The species is named after Richard M. Kemp. Richard M. Kemp, was a fisherman and hobby scientist. He was the first species to describe the species. It is not known why the name include ridley. It might be due to the fact that is displays a behavior similar to the Olive ridley sea turtle. 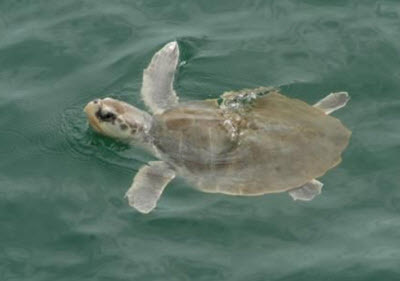 Kemp’s ridley sea turtles are considered the smallest marine turtles in the world. Adults turtles have a top shell that is almost completely round. The top shell is gray/green while the bottom shell is a pale yellow color. Kemp’s ridley turtles have a restricted range, and nest only along a small stretches of coastline in the Gulf of Mexico, because they prefer warmer waters. Kemp’s ridleys are only seldom found ut inopen water. they are more commonly encountered close to shore or in inshore waters. They enter and sometimes spawn in mangrove forests. Kemp’s ridleys are often found in estuaries, in particular, or near shallow sea grass habitats. They prefer sections of nesting beach that are backed up by widespread swamps, or large bodies of open water having seasonal narrow ocean connections. The ridley feels most at home in lagoons indigenous to Florida. They are mostly found in areas which contain muddy or sandy bottoms. These conditions make it easy for them to find their prey. One consequence of this habitat choice is entanglement with fishing nets, hooks, and other marine debris. Favorite food is blue crab. Kemp’s diet consists mainly of swimming crabs, but may also include fish, jellyfish, and an array of mollusks. Male turtles show different behavoirs. Some do not migrate at all preferring to stay in the same area all the time. Other migrate over wast areas only to return for the breeding season. Depending on their breeding strategy, male Kemp’s ridleys appear to occupy many different areas within the Gulf of Mexico. Young turtles spend the first two to ten years of their life in open waters. After that they return to the shallow muddy or sandy waters that adult Kemp’s ridleys prefer to call home. The hatchlings of this species are a solid grey/ black color. As they begin to grow into juveniles the coloration of the plastron, (bottom shell) turns to white. Kemp’s ridleys are thought to nest every two years, with approximately three clutches of about ninety eggs in one season. The Kemp’s is the only sea turtle which routinely nests in the daytime. Gale force winds usually precede nesting aggregations, which are called “arribadas”, meaning (Spanish for “arrival”). They nest from March to August. The amount of nest usually peaks in late may or early June. The eggs need 40 days or more to hatch. temerpature can affect how quickly the eggs hatch. This species try to hide their nest by compacting the sand over their nests. Removing most signs that the sand has been disturbed. Nests of the Kemp’s ridley are shallow and poorly disguised, making them relatively easy for human and non-human predators to find. Conservation efforts led by USA and Mexico have been ongoing since the 1970s, when the nesting beach of Rancho Nuevo was declared a National Reserve. Kemp’s ridley sea turtles are protected through out their range. The law is not always enforced outside the US and the species is still in danger.